Groundbreaking Golem! Pokemon One a Day! 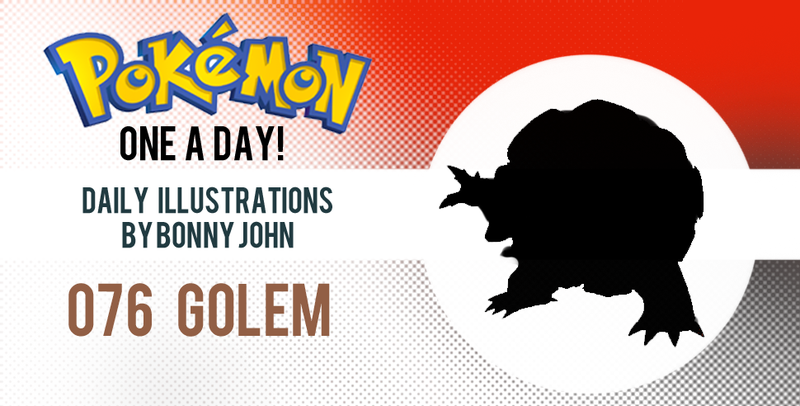 Golem gets a new look in today's Pokemon One a Day! My concept of Golem is a bit more extravagent in nature in comparison to the original's. My Golem is an entity that is made up of several parts - rocks of all shapes and sizes hover about the core of the Pokemon, found in it's spherical "body". I wanted to really emphasize the origin and meaning of the word/name Golem and have fun with a more "magical" concept, staying away from turtle x boulder like the original. Golem's original form, which has always looked like a 360 in the direction that Graveler built from Geodude, is reduced in nature here by returning the original grey bodies of the aforementioned Pokemon to the stones that make up my version. This creates a better consistency in the evolution. Originally, I had several different colored stones floating about the Pokemon, mostly browns and reds, to symbolize earth and clay and was closer to the original color palette. I even threw some obsidian, marble whites, navy blues, and grays to showcase a Golem who would be constantly picking up its environment into its body as it traveled. Things were going nicely but it looked a bit too varied for my taste, and the color scheme was too busy. I then decided to go back into grey like I imagined in my head since I have a thing for trying to fit my changes into the evolutionary lines for Pokemon that stray too far. Sometimes, I enjoy the radical changes seen in evolution. Golem...Not so much. I never cared for how squat it looked...Like it was forever uncomfortable. I wanted a body type that was big and buff, and still featured the trademark sphere for a body but give the rest of the features some breathing room, if you will. The old arms and legs are kinda like poking out without any consideration of flexibility. With Golem being the megaton Pokemon and using signature moves like roll out and self destruct, I wanted to make sure this design could still uphold those attacks in this form. How I imagine it using roll out is by standing still, and all of the "unnecessary parts" such as the head, arms, and legs would remain in place, with only a giant spherical boulder rolling at the victim. 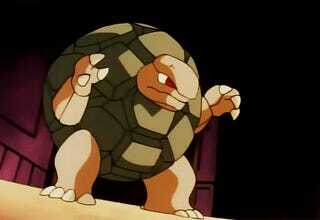 This way, Golem can watch its body attack and direct the sphere with magnetism to the situation at hand. The spherical body can pull itself into the glowing core to allow for a more tighter, more perfect sphere for faster rolling, or extend itself out (think monster truck, but spikier) to roll at slower pace but with more blunt results on contact. For self destruct, the core in it's body (a concept lifted from my Geodude art) can reach temperatures hot enough that when it reaches it's limit can send all the stones of its body flying like shrapnel of a grenade. It is more deadly and used as a last resort. Golem can build itself up after the process, but regaining the pieces of stone takes longer than usual since the core has "dried up" and needs to regain operating temperature by simply resting. And now it's time for me to rest! I had an absolute blast working on this rock-type family and enjoyed coming up with all these crazy ideas and backdrops. Although these are Pokemon I never use in game, I was looking forward to illustrating them and had fun as expected. Thanks all for reading and viewing; I hope you dig today's artwork! See you tomorrow! + Pokemon One a Day is a series illustrated and curated by Bonny John in an effort to represent the the first generation of characters from the world wide phenomenon that is known as Pokemon. The idea is simple - to draw and share one new Pokemon a day (weekends off!) until every Pokemon from the set is completed. This project is an exploration of fine art styles for learning and leisurely purposes.